Description: Using John 13:1-15 and and the foot washing theme of Holy Thursday, this leaflet explains that our intimacy with Jesus grows when we wash the feet of others. And it gives examples of how we do that. 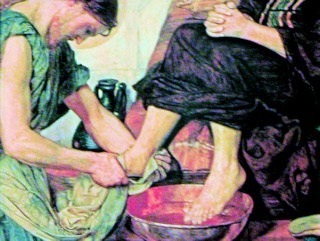 Jesus washed the feet of His disciples, not because their feet were dirty and they were too lazy to take care of their own hygiene, and also not because He wanted them to know that He was a servant who would make life easy for them. Rather, He gave them (and us) a model to imitate. Imagine Jesus kneeling in front of you, lowering Himself to the level of your feet and tenderly ministering to your needs. He is in fact doing this every day! And He is asking you to go and do likewise: Be the hands of Jesus that wash the feet of the people He has placed in your life. Ideas for use: Reflection during foot washing ceremony (great for retreats!) for Evangelization teams, RCIA team, ministry groups or leaders, parish staff, etc., as well as a bulletin insert or parish hand-out during Lent.